In 1962 the Belgian Navy flight received 2 Sikorsky HSS-1 helicopters for mine sweep and SAR missions. 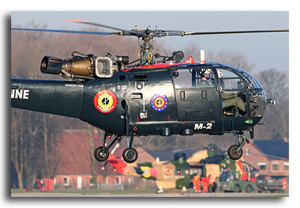 Both HSS-1’s (B7/OT-ZKG and B8/OT-ZKH) were part of the heliflight Koksijde, together with the other HSS-1’s and S-58 of the Air Force. As the Belgian Navy wanted to have supply helicopters that were able to land on a ship, the Alouette III was chosen. In 1971 three Alouette III helicopters were delivered and the two HSS-1’s were transferred back to the Air Force. From then on the Navy flight had become an independent squadron. 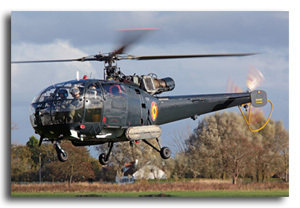 On 4 May 2001, the 30th birthday of the alouette III was celebrated at Koksijde. For this occasion, a special decoration was designed by Nico Defer and was applied on all the alouette III's. On 1 July 2004 the Navy flight was transferred to the Air Force, where they operated as part of the 40th Sqn. The Alouette III can operate from the Navy ship Godetia, Marie Louise and the Leopold I, but operates from Dutch Navy ships as well.